All right! When the witch-priestess Segolia established a temple in a frontier town, she proceeded to demand sacrifices of orcs and similar raiding humanoids – which was no problem for as long as the place remained a frontier’s town…but progress being what it is, the raiders have been bested and the witch continues to demand sacrifice. Now people have gone missing – so the PCs are tasked to investigate Segolia’s temple. While the guards provide ingress to the PCs, they do so at the request of their witch-priestess and she is pretty much not making any pretentions – the temple sports a deadly stone guardian and breath of despair traps as well as two portals the PCs need to pass to reach Segolia – on the way there, further adversaries remove any doubts of Segolia’s evil nature. The adversaries utilize the terrain to their own benefits and Segolia, as a penanggalen vampire, is an interesting final adversary. 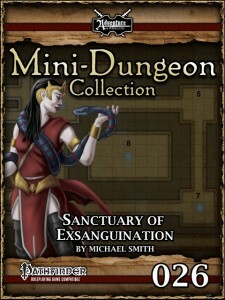 Michael Smith’s sanctuary is a solid, rather magic-heavy little mini-dungeon and sports some cool potential for encounters as well as a solid final boss. At the same time, the rooms themselves felt a bit less versatile or interesting to me. All in all, this remains a solid, slightly above average little dungeon. My final verdict will hence clock in at 3.5 stars, rounded up to 4 stars due to in dubio pro reo.